A play by William Shakespeare, performed at the Olivier, National Theatre, London: 18 December (previews began 10 December) - 29 March 2008. 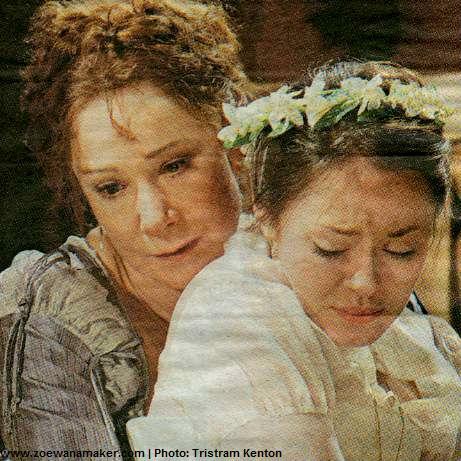 With thanks to Nadine for this photo, which shows Beatrice (played by Zoe Wanamaker) comforting Hero (Susannah Fielding). 'Don Pedro of Aragon, commander of the Spanish army in Sicily, returns to Messina [in Italy] after a victory against rebel forces which included his brother, Don John. Now reconciled with Don John, and in the company of his Italian comrades Claudio and Benedick, Don Pedro accepts the hospitality of Leonato, the Governor of Messina. A marriage is quickly arranged between Hero, a daughter of Leonato, and Claudio. Don Pedro resolves to fill the time before the wedding by tricking Benedick into marriage with his old sparring partner Beatrice, Leonato's neice. During rehearsals, Zoë and her co-star, Simon Russell Beale, gave considerable thought to the play's suggestion of a previous relationship between their characters. As Zoe explains, 'the subtext made it much more interesting' to perform (see 'Much Ado About Nothing: We Didn't Sleep Together, Did We?' interview). Since she and her colleague are older than Beatrice and Benedick are conventionally imagined to be, their casting arguably added greater emotional depth and poignancy to the characters' sparring. The mature Beatrice and Benedick recognise that their union offers perhaps their last chance for happiness. As critic Susannah Clapp observed about Zoe and Simon Russell Beale, 'these two extraordinary actors have re-fashioned it [the play] from within'. Further insights into the production were provided by cast members, including Zoe, at Whatsonstage.com's Q&A session. Photos of the event, which took place after a performance of Much Ado About Nothing, can be found on the Whatsonstage.com blog. Zoe and Simon Russell Beale performed as another sparring couple, Princess Caroline and her reluctant suitor, George, the Prince of Wales, in Battle Royal (1999), also at the National Theatre. Zoe's other productions as a member of the National Theatre Company include: The Importance of Being Earnest (1982), The Bay at Nice and Wrecked Eggs (1986), Mrs Klein (1988), The Crucible (1990), His Girl Friday (2003), and The Rose Tattoo (2007). As critic Mark Shenton remarked to Zoe, during the period in which Much Ado About Nothing was being performed, 'you're virtually the house actress' at the National now. Moreover, strong ties with this particular theatre have led to her becoming an NT Associate, giving her the opportunity to help shape the venue's artistic policy. During her first season on the London stage, Zoe played Hero in a production of Much Ado About Nothing (1974) at the Young Vic. Zoe gave a 'dazzling' performance in Much Ado About Nothing, praised Nicholas de Jongh, writing in the Evening Standard. The Telegraph's Charles Spencer was moved by the 'unforgettable tenderness and humour' of her and co-star Simon Russell Beale's portrayal of the former lovers, Beatrice and Benedick. Benedict Nightingale, in The Times, celebrated the 'beautifully judged switches between humour and gravity that make their pairing exceptional'. The Stage's John Thaxter wholeheartedly agreed: 'the final cheers belong to the central couple and their delightful stage partnership'. Numerous other positive reviews of the production include: Warwick Thompson for Bloomberg News, Paul Taylor and Kate Bassett in the Independent, Michael Billington in the Guardian, Charles Isherwood in the New York Times, Philip Fisher for the British Theatre Guide, Harriet Davis for Rogues & Vagabonds, Maxwell Cooter for Whatsonstage.com, and Melanie Phillips in the Spectator. The production was also discussed on BBC Radio 4's 'Saturday Review' programme.